Blue Tide 7B, in Seacrest, Florida, is a beautifully furnished and decorated 3 bedroom condo (includes the loft), 3 full baths, 2 balconies overlooking the amazing Gulf of Mexico, is very spacious with over 1800 square feet of living space. The beaches have been voted as one of the best of 'Americas Beaches'. 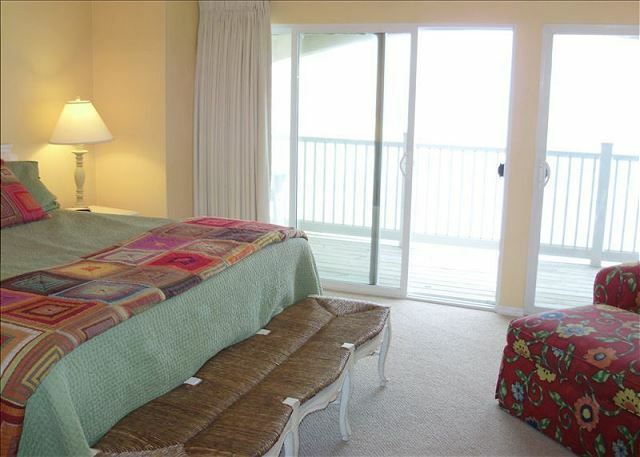 You can walk right off the family room balcony to the steps to the gorgeous white sands and gulf. This is a unique feature that is great. It is located on scenic 30-A, 2 miles west of Rosemary Beach and Alys Beach and a few miles east of Watersound, Seaside and Seagrove Beach. I get a lots of compliments about how the condo is decorated and how comfortable it is. The condo is fully furnished to make you feel at home when you stay there. It is located on a 17 mile bike trail that runs along 30-A. This is lot's of fun for families. Bikes can be rented and delivered to the condo. You can enjoy the incredible panoramic views to the east and west from the 2 private balconies of the sugar white sand and emerald green water of the gulf. It is truly breathtaking. There is nothing more beautiful and relaxing than sitting on one of the balconies in the morning enjoying coffee and/or breakfast or in the evening looking at the gulf and listening to the waves. The condo is designed so the sun never comes directly into the condo and no one can see in, so you never need to close the drapes and can enjoy the great Gulf views from the master, kitchen, dining area and family room all day long. Sun up to sun set. Even at night there is privacy and no one can see into the condo. There is a private pool on-site. The condo offers 2 large bedrooms with comfortable king size beds and a full bath attached. There is a loft with 2 single beds. The loft is semi-private and like a retreat for children, teenagers and maybe young single adults. Because it is semi-private and does not have a bath attached, it might not be right for couples. There is a 3rd full bath on the main floor. There is also a pull out queen size sleeper sofa. 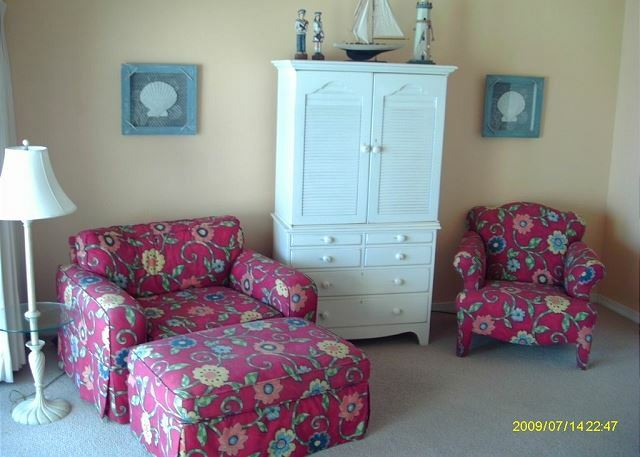 The family room has 2 comfortable swivel rocker chairs with another chair and a queen sofa. It has an LED TV with cable and high definition on channels 800 to about 850, plus a DVD player. Each bedroom has a flat screen TV and the loft has a DVD player. The master bedroom has a vanity area between the bedroom and bathroom for a little more privacy. It also has a large walk in travertine shower with a regular and a overhead rain shower head. Very relaxing. There is wireless internet.. The condo comes with a fully equipped kitchen, seating for 6 around the large dining table and a breakfast bar with stools. Both the master and family room have double sliding glass doors that open to balconies with seating and tables. Linens, towels and washcloths and a full sized washer/dryer are provided.